A T.H. Chan School of Public Health confirms kids are not getting enough time to eat lunch. Elementary and middle school students who are given at least 25 minutes to eat lunch are more likely to choose fruits and consume more of their entrees, milk, and vegetables according to a new study released in the Journal of the Academy of Nutrition and Dietetics. There are currently no national standards for school lunch period length and little is known about the association between the amount of time students have to eat and school food selection and consumption. Our aim was to examine plate-waste measurements from students in the control arm of the Modifying Eating and Lifestyles at School study (2011 to 2012 school year) to determine the association between amount of time to eat and school meal selection and consumption. We used a prospective study design using up to six repeated measures among students during the school year. One thousand and one students in grades 3 to 8 attending six participating elementary and middle schools in an urban, low-income school district where lunch period lengths varied from 20 to 30 minutes were included. School food selection and consumption were collected using plate-waste methodology. Logistic regression and mixed-model analysis of variance was used to examine food selection and consumption. Compared with meal-component selection when students had at least 25 minutes to eat, students were significantly less likely to select a fruit (44% vs 57%; P<0.0001) when they had <20 minutes to eat. There were no significant differences in entrée, milk, or vegetable selections. Among those who selected a meal component, students with <20 minutes to eat consumed 13% less of their entrée (P<0.0001), 10% less of their milk (P<0.0001), and 12% less of their vegetable (P<0.0001) compared with students who had at least 25 minutes to eat. During the school year, a substantial number of students had insufficient time to eat, which was associated with significantly decreased entrée, milk, and vegetable consumption compared with students who had more time to eat. School policies that encourage lunches with at least 25 minutes of seated time might reduce food waste and improve dietary intake. Elementary and middle school students who are given at least 25 minutes to eat lunch are more likely to choose fruits and consume more of their entrees, milk, and vegetables according to a new study. Boston, MA ─ Students with less than 20 minutes to eat school lunches consume significantly less of their entrées, milk, and vegetables than those who aren’t as rushed, according to a new study from Harvard T.H. Chan School of Public Health. The study will appear online Friday, September 11, 2015 in the Journal of the Academy of Nutrition and Dietetics. “Many children, especially those from low-income families, rely on school meals for up to half their daily energy intake so it is essential that we give students a sufficient amount of time to eat their lunches,” said Juliana Cohen, adjunct assistant professor in the Department of Nutrition at Harvard Chan School, assistant professor in the Department of Health Sciences at Merrimack College, and lead author of the study. 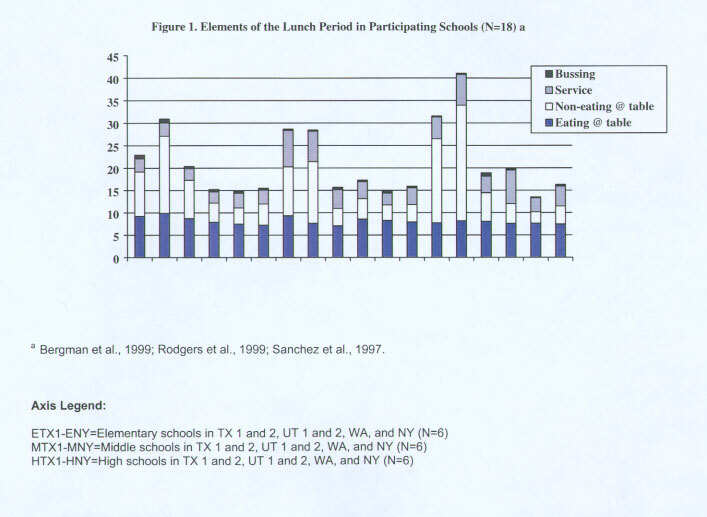 The researchers wanted to examine the effect of lunch period length on students’ food choices and intake. They looked at 1,001 students in six elementary and middle schools, with lunch periods ranging from 20-30 minutes, in a low-income urban school district in Massachusetts, as part of the Modifying Eating and Lifestyles at School (MEALS) study, a collaboration between Project Bread and Harvard Chan School. They analyzed the students’ food selection and consumption by monitoring what was left on their plates at the end of the lunch period. The researchers found that students with less than 20 minutes to eat lunch consumed 13% less of their entrées, 12% less of their vegetables, and 10% less of their milk than students who had at least 25 minutes to eat. While there were no notable differences between the groups in terms of entrée, milk, or vegetable selections, those with less time to eat were significantly less likely to select a fruit (44% vs. 57%). Also, there was more food waste among groups with less time to eat. The study was funded by a grant from Project Bread and Arbella Insurance. Cohen was supported by the Nutritional Epidemiology of Cancer Education and Career Development Program (R25 CA 098566). 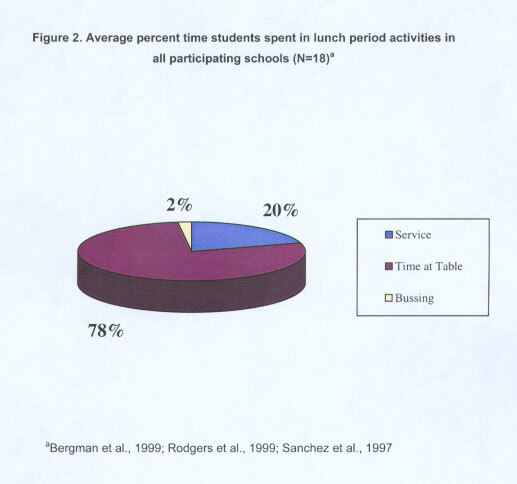 In the Minneapolis public schools, we are supposed to have 15 minutes to eat, which would be bad enough. But realistically we get only 10 to 11 minutes (we have been timing it). Having to rush to eat is part of the reason for the obesity epidemic, eating disorders, indigestion and kids not doing well in school. There is research that proves all of these points. Kids just need more time to eat at school. Rushing to eat high-calorie meals at school, or at home, is the cause for the gastroesophageal reflux. This is often called heartburn. Heartburn feels bad — the symptoms are burning in the chest, overall chest pain, burning in the throat, difficulty swallowing, food sticking in middle of the chest or throat, sore throat and cough. School-age children especially need nutrition, but we are the ones who don’t get a choice about how long we get to eat. We are growing and have to get energy. In middle school especially, our bodies need energy, because middle-school kids are going through puberty. It is essential that we get enough time. Younger kids, meanwhile, tend to eat much more slowly. That means they eat less in the time allotted and behave poorly for the rest of the day. When about a third of American children and adolescents are overweight or obese, the schools shouldn’t be adding to the problem. But they are, perhaps unknowingly. Research shows that eating fast causes people to consume more calories and enjoy the meal less. There are also problems with kids being underweight. Those children just use lunch to talk, instead of having time to eat and talk. Lunch is an important social time. Teachers always tell us to socialize at lunch and recess, not in the classroom. But we cannot do that if we are scarfing down our lunches in 11 minutes. And at recess nobody can socialize or run around if they are hungry or we feel sick. Lots of kids stay in classrooms during lunch so they have time to actually eat and socialize. Pretty soon nobody will be going to the lunchroom or recess. We don’t have time to eat there; by staying in our teachers’ classrooms, we do. The Minneapolis public schools apparently have a district rule against eating outside — this was told to us by our lunch and recess lady. She said it was because we would litter. Our friends helped us come up with multiple ways of being able to eat outside. We could set up tarps by the field or in an unpopulated area with the same trash systems as in the lunchroom (fall and spring). Another idea is have one teacher or staff member stay in the lunchroom with kids who need to finish eating, so they can stay in and finish (winter)…. Almost no one finishes what he or she gets to eat. That means a lot gets thrown away, wasting food. Food waste affects many things in our world. It wastes much more than food; it wastes the time and energy it takes to make the food product. That is a sign that we are hurting our planet. Given the amount that must be packed into the school day, it is no surprise that the lunch period often get short shrift. Explore resources and opportunities for action here and on www.wholechildeducation.org, and together we’ll change the face of education policy and practice. Find sets of indicators related to each tenet below. Taken together across all five tenets and the central necessities of collaboration, coordination, and integration, these indicators may serve as a needs assessment, set of strategic goals and outcomes, framework for decision making, or the definition of what a whole child approach to education truly requires. Download the indicators (PDF).